LG chem is now ranked as the world's largest lithium-ion battery manufacturer with 29,000 employees and manufacturing facilities in South Korea, China and the US supplying a diverse range of energy storage products for electric vehicles, portable electronics (mobile phones) and stationary applications (ESS). The RESU or 'Residential Energy Storage Unit' range consists of both 48 Volt and higher voltage 400V lithium battery options. The 48V series is available in 3.3kWh, 6.5kWh and 9.8kWh sizes with a maximum capacity of 19.6kWh using two of the 9.8kWh (RESU10) battery units combined. LG also announced an even larger 13 kWh 48V battery is due to be released in 2018. The higher voltage (400V) units are available two sizes - 7kWh and 9.8kWh explained in detail below. 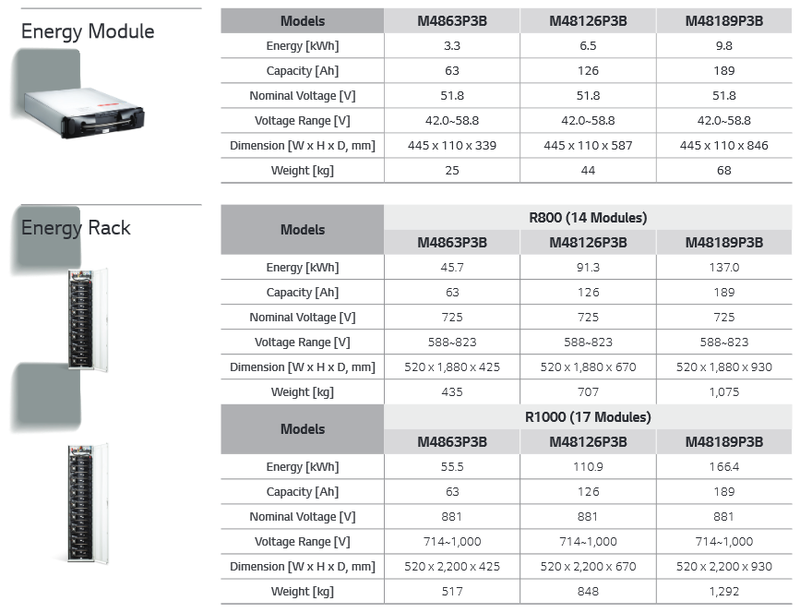 The usable storage capacity is based on 90% of the total rated capacity for the 48V series and 95% for the 400V series. All RESU batteries are IP55 weather rated which means they can be installed in a semi-outdoor location such as a verandah or carport, but should not be located in a position exposed to direct sunlight, especially during the warmer months. As with any electrical/battery system heat is detrimental to the performance and life of the system. Since the release of the first Tesla Powerwall there has been an emerging trend towards high voltage (classified as LV) 400 Volt battery systems which have a number of benefits over the traditional ELV 48V batteries including slightly higher efficiency and the ability to be DC coupled with the solar array which operates at a similar voltage. However all dedicated off-grid battery inverters operate at the traditional 48V range so the Higher voltage batteries will generally not work for off-grid installations. There is a growing number of compatible high voltage hybrid inverters including the well regarded SolarEdge StorEdge hybrid inverter, the new Huawei FusionHome and the SMA sunny boy storage which is now available in higher capacity (up to 6.0kW output). LG chem have obviously been listening to solar installers and have been working with many inverter manufacturers to ensure there product is compatible and easily configured with almost all of the best and most popular hybrid and off-grid battery inverter/chargers on the market. Unlike the first Tesla Powerwall which was limited to two inverter types the range of compatible inverter brands for the RESU range (LV) now includes a huge range 48V hybrid and off-grid inverters. More options coming - LG chem are also working closely with several leading inverter manufacturers including SMA, Fronius and SolarEdge and will be delivering an even greater range of battery options throughout 2018. As opposed to many other manufacturers which use cyclindrical battery cells LG chem use a unique Polymer 'pouch' flat laminated battery design (PH3) which LG claim enables much higher energy density with increased reliability and safety. Layering the battery cell sections rather than rolling or bending the cell structure reduces the likely hood of failure and enables even heat dissipation across the cell area. Fire Safe - The LG chem lithium modules have been fire tested to the UL1973 test standard which requires there to be no explosion or sign of fire when the battery cells is forced into a thermal runaway condition. "LGC warrants and represents that the Product retains at least 60% of Nominal Energy for the either 10 years after the date of the initial installation or for a minimum Energy Throughput as per the table below (whichever comes first) when the battery system is operated under a normal use followed by the specification and the manual provided by LGC"
The warranty also contains detailed operating criteria which limits the operating temperature and energy throughput over the battery life. This can be problematic for installations in hotter climates such as regional Australian towns and remote locations. An exposed outdoor installation could easily reach 45 degC during the afternoon in many Australian towns so careful consideration needs taken when locating the battery, preferably inside a garage or a well insulated/ventilated area as high ambient temperatures above 45 degC can accelerate battery aging and reduce storage capacity. The LG RESU batteries have built-in sensors to monitor cell temperature and voltage to help extend battery life. To reduce degradation or the chance of thermal runaway the LG battery management system de-rates the power output by 50% once the internal cell temperature rises above 50 degC and further de-rates power output completely once the temperature goes above 55 degC. Solar battery comparison - LG Chem RESU V's Tesla Powerwall 2 plus leading batteries from the top manufacturers. See the complete solar battery comparisin and review here for full details and specifications including estimated lifetime, cost per KWh, power output and compatibility with leading inverters. LG chem also supply a range of battery units designed for high capacity rack mount commercial and utility energy storage systems with long duration applications (greater than 1 hr). These are made up of 52V modules which are connected in series to create modular and scalable high voltage (LV) energy storage systems. LG chem have a range of ‘Power modules’ designed for high output short duration applications (less than 1 hour) which are ideal for commercial installations where ‘peak lopping’ (also known as peak shaving) is required to maintain power draw from the mains below a preset level. This reduces strain on the electricity network and eliminates the extremely high usage charges associated with peak demand that cannot always be reliability sustained by the mains supply. The large scale storage systems can also be utilised by utility companies to help balance the electricity grid during peak times and of course help with the transition to a renewable energy power grid.